"I have no words to describe what happened. I cannot face the suffering of these people," the mayor of Caniço, Filipe Sousa, told broadcaster SIC TV. 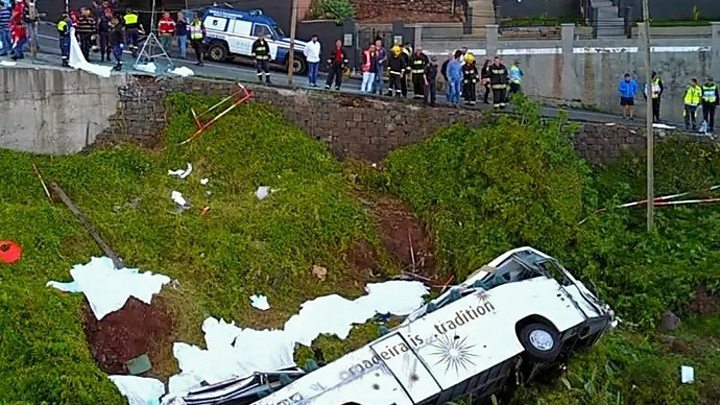 The vice-president of Madeira's regional government Pedro Calado said the bus met safety standards and so it was "premature to talk about what caused the crash". An investigation into the crash has been launched, with the bus company, Madeira Automobile Society (SAM), saying it has a "deep commitment" to finding out exactly what happened, local newspaper Diario de Noticias Madeira reported. The scene of the crash has been sealed off and the injured transferred to a hospital in the island's capital, Funchal, Lusa said. The German government spokesman Steffen Seibert tweeted: "Our deep sorrow goes to all those who lost their lives in the bus accident, our thoughts are with the injured."